We all make mistakes. These shoes were my latest. My trusty Sidi Dragon mountain bike shoes have seen better days. I’ve replaced the treads and buckles at least once, but the uppers were starting to fall apart. I got four years out of them, though–I think that’s impressive. To replace the Sidis, I decided to try something completely different–the Giro Empire shoe. Even better, I managed to snag a pair in camouflage! I reasoned that on long rides, the part of my foot that starts to hurt first is the top–and that laces are the best way of distributing pressure across the top of my foot. They arrived last week, and damn they are beautiful shoes. I wish I could get some regular shoes like this. The aches set in around mile 25. The top of my left foot–but not my right–started to hurt. I tried to ignore it, but by mile 35 I couldn’t stand even one more minute. I hopped off the bike in the middle of the road, ripped off the shoe and hopped around for a while. Then I struggled home with the laces on the left shoe almost completely undone. Not a good result, right? It’s clear that my left foot and my right foot are slightly different in shape, because my right foot was fine. Please note that, like all other cycling-related accessories, whether a shoe or bib short or chamois creme or anything else works is a very individual thing. The shoes are extremely well constructed and very light (perhaps because of the lack of buckles and straps). And they are beautiful. If nothing else, I think my experience with these shoes highlights the value of the Rapha Grand Tour shoes. Like any other leather shoe, the Rapha shoes started out tight and uncomfortable, but after 10-15 hours they molded themselves to my feet. I can easily spend 18 hours or more on the bike without foot pain in those shoes. So…just because they didn’t work for me doesn’t mean they won’t work for you. 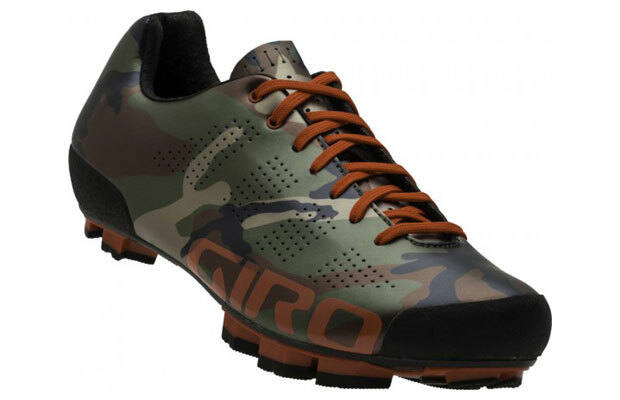 If you’re in the market for some Giro Empires–and especially if you want the camouflage version–let me know (my contact information can be found via the About page). Worn once, size 10, $200 ($100 off retail). I even have the original box. Only 400 made! Sold. This entry was posted in cycling apparel, reviews on September 15, 2013 by John Ferguson.